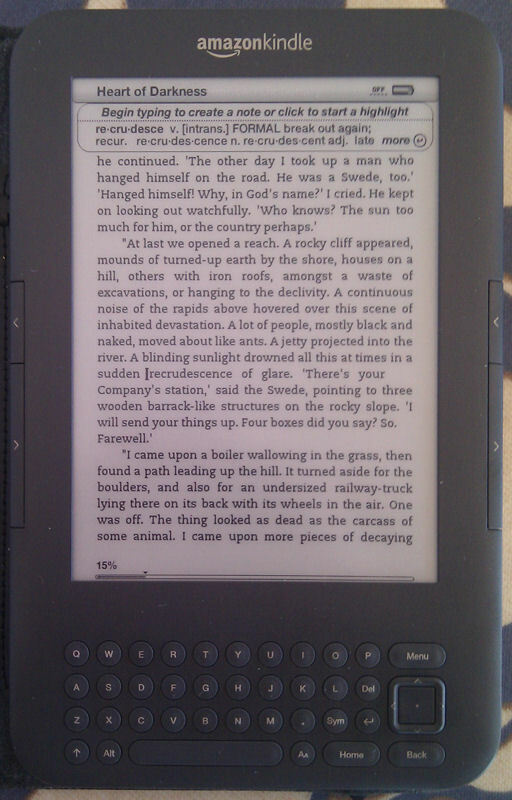 My partner was kind enough to buy me an Amazon Kindle for Christmas and I have enjoyed using it. Yes there were the problems with them registering me to Amazon.com, rather than Amazon.co.uk (thereby incurring foreign transaction charges). And yes they didn’t cancel a trial Economist subscription I took out on the former when I was transferred to the latter. However, these issues were sorted out and money refunded. I suppose I had the same initial reaction as many people; that they had left a sticker covering the screen, which was intended to demonstrate what the display looked like. After failing to peal it off (thankfully not too energetically) I realised that the screen was actually that clear and that different from a “normal” computer display (I was thinking smart ‘phone or laptop). I am writing this post on one of my many laptops, the screen is OK, but the Kindle is much easier on the eye and pretty close to a high-quality printed page. Suffice it to say that I downloaded new copies of several of my favourite books to it with the prospect of re-engaging with them at my leisure. But enough of me singing the general praises of the device, I have discovered a particular benefit. While this may well be realised by other people, it is of particular pertinence to devotees of the works of Joseph Conrad. As one of the undisputed giants of English prose, it is rather ironic that English itself was either Conrad’s fifth, or sixth, language (chronologically: Polish; Russian – though he later, perhaps understandably given the turbulence of the times, repudiated this as a language; French; Latin; German; and – finally, when he was in his twenties, English). I have greatly appreciated his work, since first reading Heart of Darkness. I won’t attempt to offer a literary appreciation of his genius and leave this to others with greater talents in that area. However, despite coming late to the English tongue, Conrad was a master of it and had an amazing vocabulary. I generally view myself as being reasonably erudite (less charitably I have been accused of having swallowed a thesaurus), but used to have to keep a dictionary at hand when reading Conrad; either that or try to impute meaning from context (probably getting it wrong more times that I care to admit). In some ways, my own limitations slightly diluted my enjoyment of reading. It is a bit distracting to put down one book, pick up a dictionary, look up a word and then revert to the original tome (it was even more complicated as a child reading Jules Verne’s 20,000 Leagues under the Sea with both a dictionary and gazetteer to hand!). While this feat is more than achievable with the works of other authors, it is impossible to read Conrad on the Tube. However, the Kindle is a joy in this respect as you can look up words using the built in dictionary, quickly, easily and without disturbing the thread of the narrative too much. This has got me out of my rather lazy habit of assuming that I sort of know what a word means and thereby given me a few surprises. Based on the the initial illustration above, for example, I had to modify my understanding of recrudescence! This is not the first time that Conrad has appeared in the pages of this blog, I had the temerity to also reference him in Aphorism of the Week some time ago. ← What is wrong with this picture? I’m not a native speaker, as you know, so I constantly confront myself with my incomplete language knowledge. Curiously, in these days, I resolved to read, with the same attitude, Tolkien’s Lord of the Rings and your Heart of Darkness. After having read both in Italian, it’s an amazing experience! Your English is significantly better than my Italian :-).